I want to thank Tusia Lech for her amazing generosity, and her always loving and kind heart for every one of us. She is a true beauty. Inside and outside. I will treasure your kindness in my heart forever. Jennifer Hedger, your warmth and believe in me are still making me humble, and I will treasure the gratefulness of being part of your amazing team. Thank you for everything. I have created a layout to give you all some sweet and tender advise...Pick flowers, not fights, and stay wild and free. Forever. 7 Dots Studio products always have made me create with passion, and most important, the gorgeous papers, the colors, the word stickers, they always seem to help me process my emotions, sometimes very deeply, sometimes sweet and light. This paper brand is the best brand ever for me. Dusty Attic is the only chipboard company that really fits my style. High quality and such a great assortiment. The best chipboard brand for me! Definitely! The moodboard is gorgeous, the soft pink and purple colors, the flowers, the snowflakes, the shimmering lights, they all inspired me to create this layout. 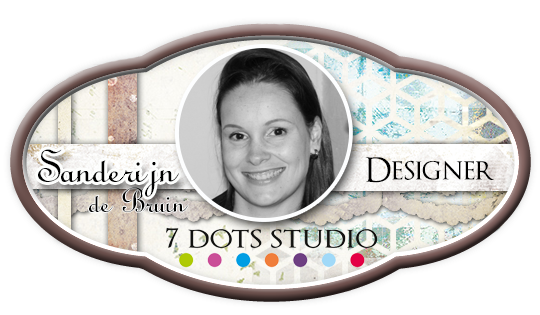 December is the month I always love to create some Christmas themed tags with 7 Dots Studio tags. The tags are easy to create. Start with clear gesso on two different tags from the Paint Chips collection. Then add the desired stencil pattern with modelling paste. 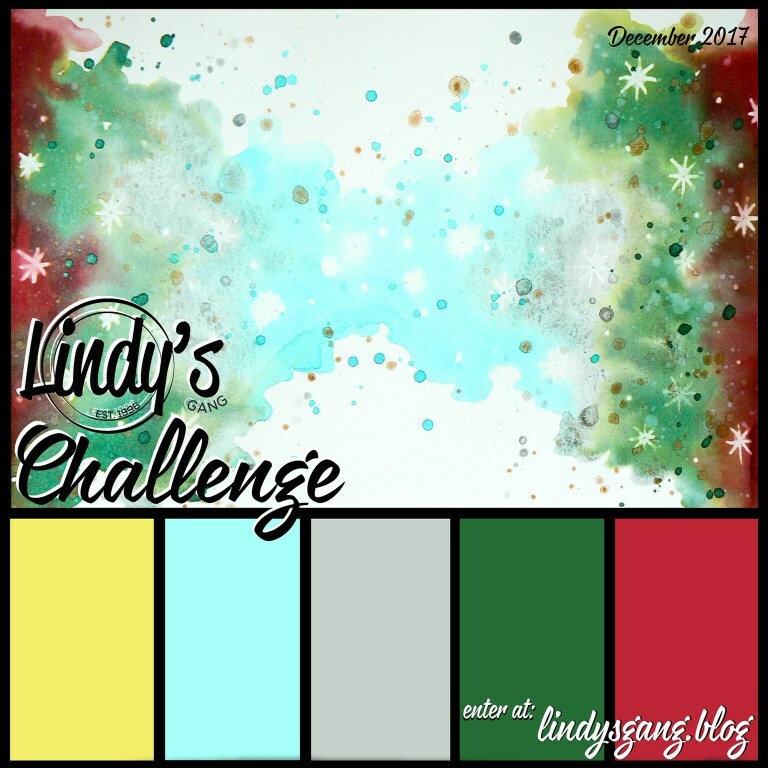 When this is dry, start spraying the tags with Lindy's Starburst shimmer sprays. When they are dried with a heattool, I sew them on a piece of 6 x 6 paper, and cut the edges. Crumble the edges a little and add some wax to give it a soft touch. 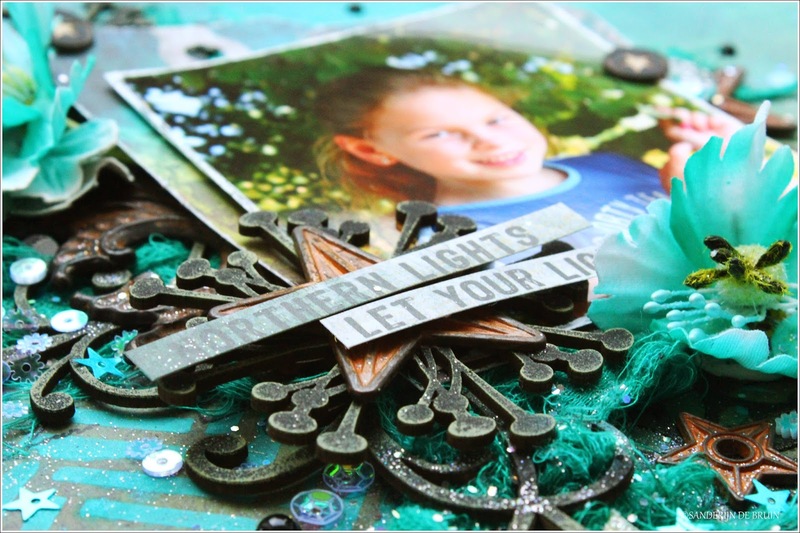 Last step, build a 3 dimensional tag with textured wool, flowers, chipboard pieces, Accent Scrapbooking flairs and of course some word stickers. Add some December sparkle with sequins and glitter and you're done! I wish you all a very merry Christmas and a good and healthy 2018! New paper collections always give me such an inspiration boost. When my DT box arrived from 7 Dots Studio, I was (again) overwhelmed with the gorgeousness of the papers, like every single time new collections come out. 7 Dots Studio has been my favourite brand, ever since I discovered this brand in 2015. 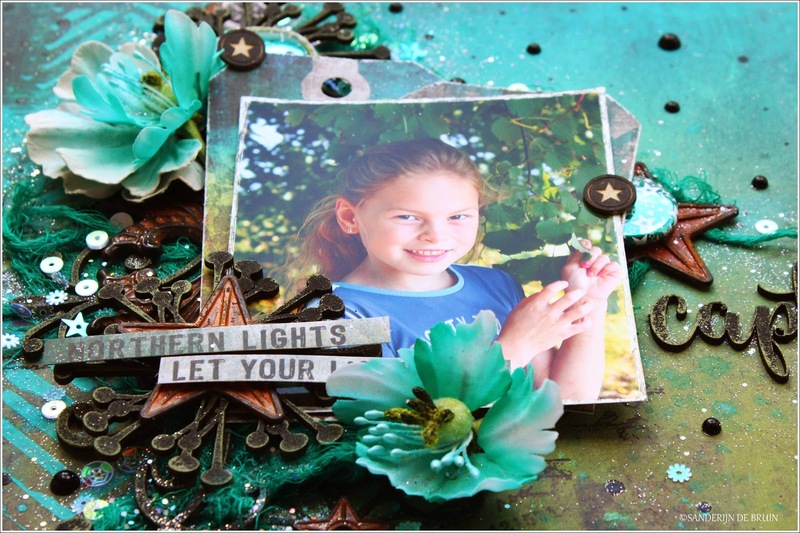 So here is my first layout with the beautiful Paint Chips collection. I started with using the Hatched stencil and patina effect paste. When it was dry, I started stamping the new clear stamps with black stazon. 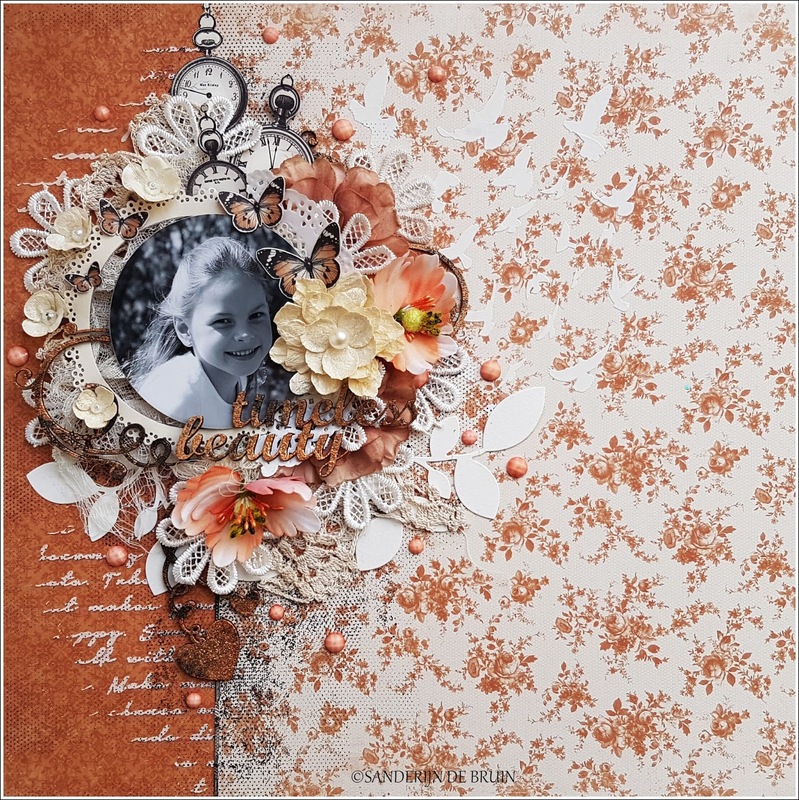 Then I started to build up my page with cheese cloth, Dusty Attic chipboard, rusty metal embellishments, flowers, paper die cut elements, Accent Scrapbooking flairs and word stickers. I finished my page with some glitter and sequins, for a little extra sparkle. 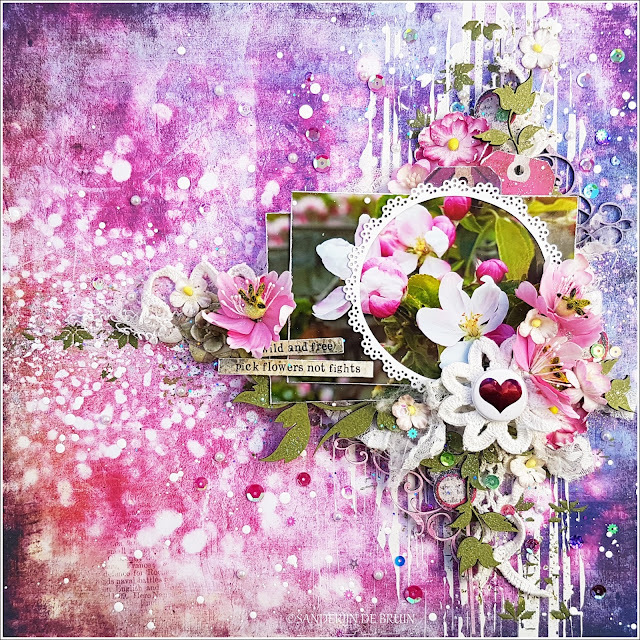 I was asked to be guest designer at Pion Design this month, and I have created this romantic, flowery page for you, with gorgeous Dusty Attic chippies and stencil patterns. 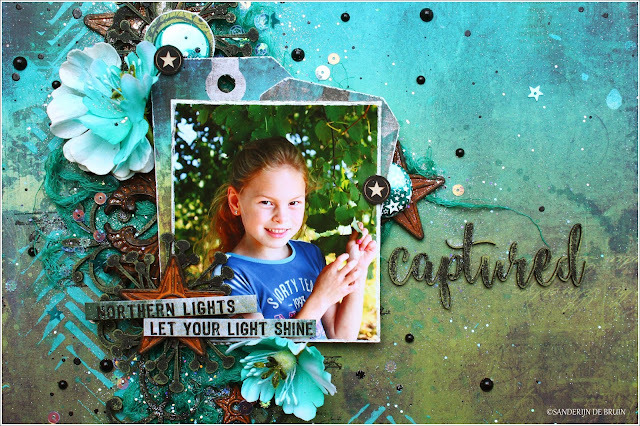 I used the creative script stencil and the birds stencil in the background, along with some stamping here and there. I painted my chippies black and used copper mica powder on it. Flowers, lace and die cuts are used to give the page more body. There is a new challenge up and running on the blog from 7 Dots Studio. It's theme is sunrise-sunset. 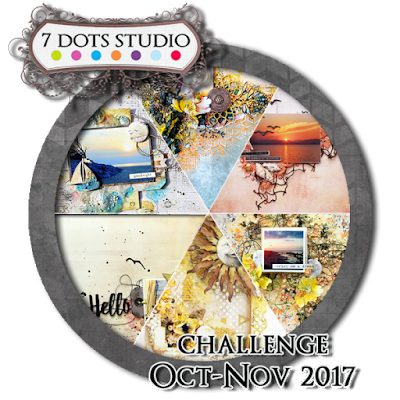 Will you join us this month? When I heard about the theme from this challenge, I immediately knew I wanted to use this picture. This picture is from the first sunset at Lake Garda (Lago Di Garda) in Italy, when we arrived there this summer. I have never been to Italy, until this summer, and I absolutely love the country already. 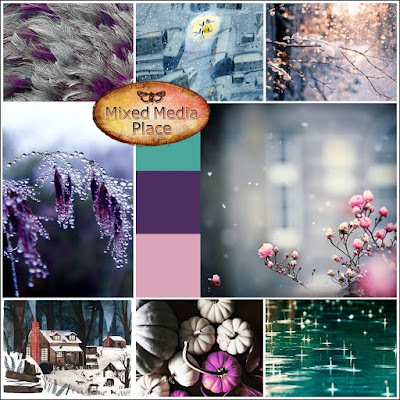 I created a mixed media layout for you. It's been a while but I had so much fun, using sunny colors and a some elements of fall. I started with clear gesso on the paper, to give the paper more strenght to hold the inks and other mixed media supplies. 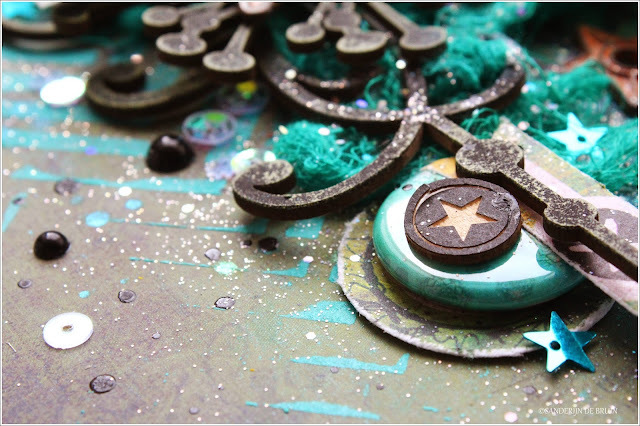 Next I added the star stencil pattern with light paste mixed with iridiscent gold mica powder. When all was dry, some stamping with Hazy Days grungy clear stamps, my all time favorite text clear stamp from the Homegrown collection and a butterfly stamp. 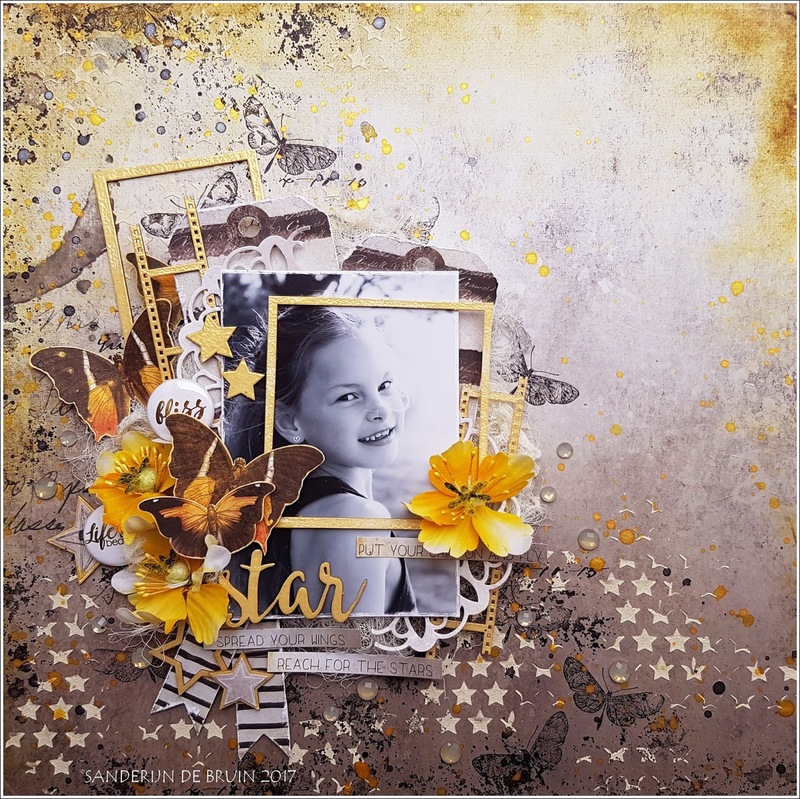 Next I started building my page with cheese cloth, tags, die cut elements, flowers, chipboard, flairs and word stickers. 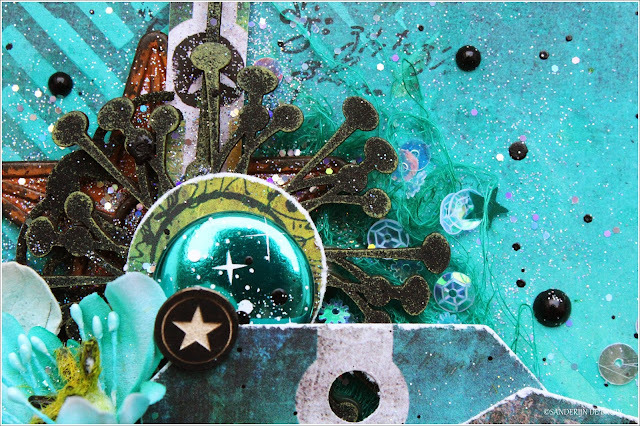 I added yellow embossing powder on all the pieces of the chipboard. 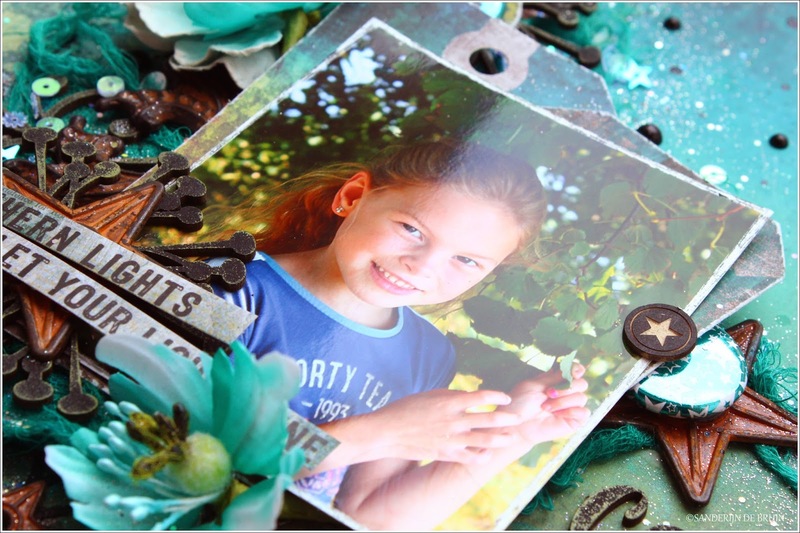 I have created a mixed media canvas with a picture of my little girl. This picture of her makes me feel so blessed and proud. I hope she will always be able to love, believe and dream... forever! 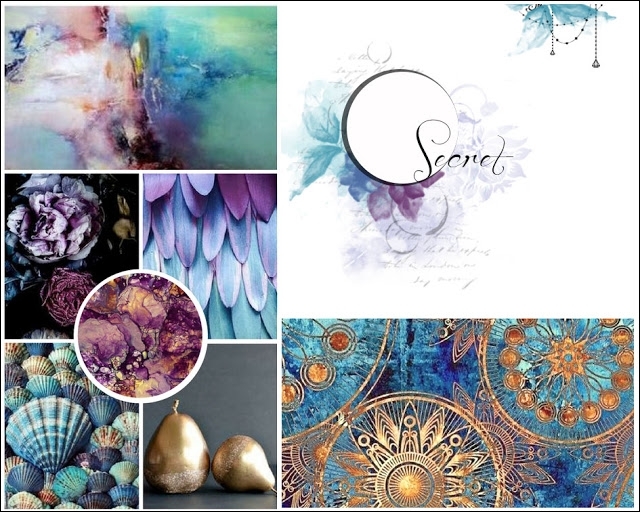 The golden mandala's and the teal, blue and purple colors were my biggest inspiration from the moodboard from Mixed Media & Art. The watercolour effect made me want to create with water and inks, and lot's of white space. I was also inspired by the round photo from the sketch from the MM&A moodboard. I started with white gesso on the canvas, and when it was dry I added the Mandala stencil pattern and the Threaded Beads stencil with modelling paste. When it was dry I added a second layer of white gesso. Meanwhile I painted the Swirl Vine also with white gesso and glued it on the canvas. 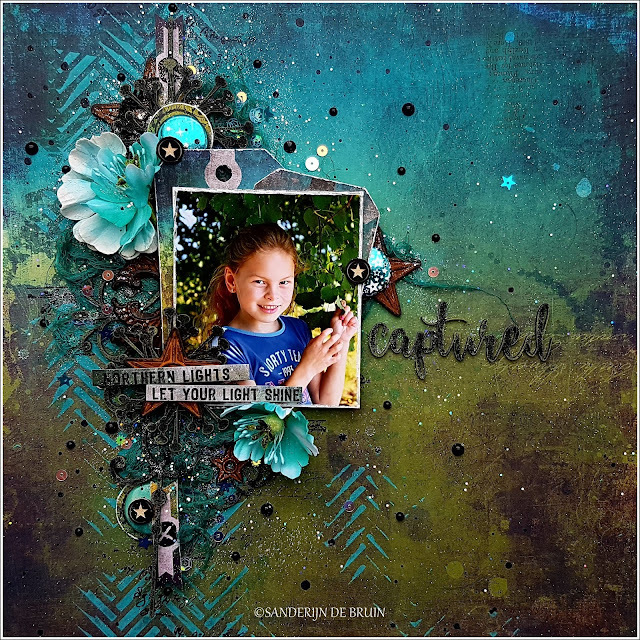 I used Lindy's Stamp gang sprays to give the canvas blue, teal and purple colors. I dripped the colors on the canvas and used a water spray bottle to let the inks move around. Some tissue paper here and there to remove some of the ink. Next step, another layer of white gesso, dabbering gently with a distress ink tool. As a finishing touch I used Finnabair Vintage Gold wax to give every item and the texture on the canvas, more dimension and depth. I loved how the mandala pattern turned out with the gold wax on it. Invitée du calendrier de l'avent chez Florilège Design ! 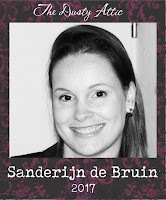 ©Sanderijn de Bruin 2015-2017. Thema Eenvoudig. 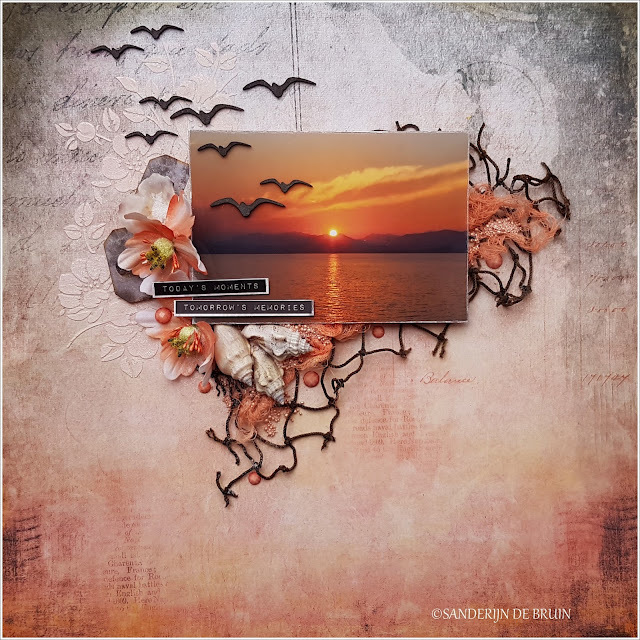 Mogelijk gemaakt door Blogger.